I want to start marketing to insurance companies. Where can I get started? Do e-mails work? How about Google AdWords? What can you offer us? Marketing to insurance companies is the hardest of the three primary industries to market to – Legal, Corporate, Insurance. You don’t market to insurance companies, you market to insurance adjusters. You don’t cold call insurance adjusters, you build relationships. Insurance adjusters are the main decision makers for insurance companies. 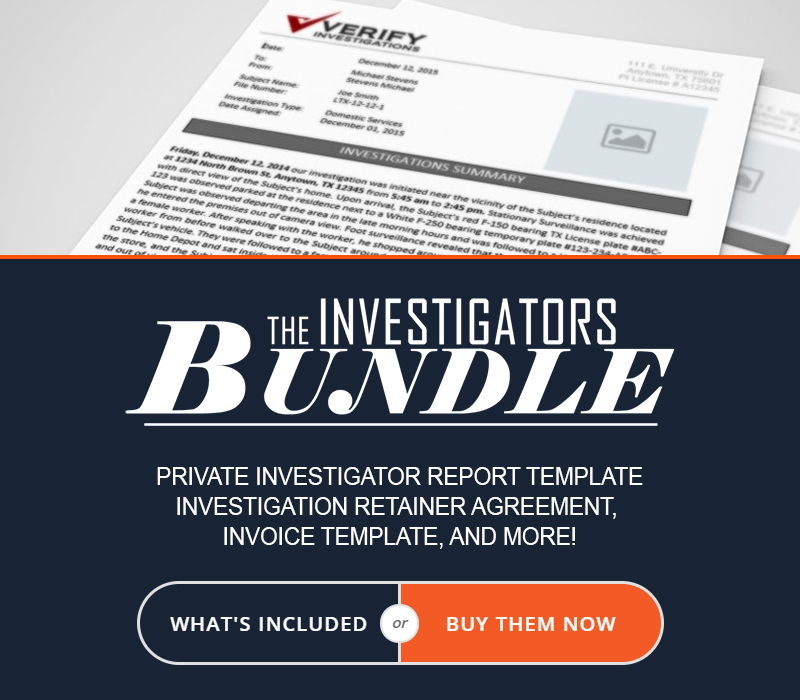 Unless the insurance company has a policy that states “We are only to do business with XYZ Investigations”, adjusters can do business with any investigative company they see fit for their needs. At any given time, an insurance company with 20 adjusters can have 15-20 (sometimes more) investigation agencies working for them through individual adjusters. The point I’m trying to make here is – don’t market to ABC Insurance, market to their employees. Try to avoid cold calling insurance agencies. This is the equivalent of a dog chasing a speeding car – nothing good is going to happen when it catches up to the car. If you go to an insurance building, manage to get inside, then walk up to a random cubicle, they’re going to look at you more of a threat than a helper. You have to build rapports with adjusters and THEN make your move. Take your company as an example: If a random sales person walked to your front door and asked “I’m here to see anyone that wants to buy my service, can I come in to the office and talk to them about it?” the chances are your secretary will turn them away. If in the other hand the sales person made the effort to meet you at a conference, and finished off by saying – “I’ll follow up with you at a later time” the sales person will come to your office at a later day and say “My name is John Smith, I’m here to see Michael Smith, I told him I would come by sometime this week. Can you let him know I’m here?” The latter statement shows a purpose for your visitation. It makes you look like you belong at the establishment. If you don’t meet and greet insurance adjusters, TPAs, business owners, and other company professionals that can use your service, you’re going to have a very hard time getting through the front door to pitch your sale. Another thing to remember is that insurance adjusters are very loyal to their investigators. They build relationships, get preferential treatment, and are offered services specifically designed for their needs. The chances that you’ll be able to take away a case from an established company are slim to none – unless the adjuster is completely dissatisfied with their current investigation service provider. I know… another example here… If you go to a barber for 5 years straight, tell him your stories, and he treats you well, the chances that you’ll switch barbers because a “new guy” just opened shop is going to be slim to none. With that being said, if your barber has continuously messed up your hair, and a new barber opens up by your home, that is much closer, and has that “fire” to offer the best customer service available – you’re barber is going to be in for a rude awakening. Find local and state level associations and conferences that are made specifically for self-insured companies and insurance adjusters. They have local level, state level, regional, and even national conferences and associations that must be attended to by all insurance agents as a continuing education requirement. The same way private investigators have State Associations like – TALI, CALI, FALI – insurance adjustors have the same type associations that they must attend. If you go to a PI conference, you’ll meet private investigators and investigation agency owners. If you go to an insurance adjuster conference, you’ll meet insurance adjusters looking for service providers. Here is an example of a national conference that is held in Las Vegas: The National Council of Self Insurers. Search on Google for upcoming Self Insured and Insurance Related conferences in your area, then find the ones you feel are most important to you – and mingle. You need to make connections. Does sending an e-mail work? Again, without having a connection or purpose to e-mail a client, the e-mail is going to go unread. We’ve managed campaigns for clients in the past that hold upwards of 4,500 e-mails to different adjustors across the industry. Most of those e-mails go unnoticed, the average open rate is about 7%. Every morning when we get to our office, we have 50-80 e-mails on my inbox alone. About 10 of them are from clients (or future leads), the rest are from service providers trying to sell us services that we don’t need or use. We get bombarded by newsletters, spammers, and Nigerian kings looking to hand us $50,000,000 just because they like our name. Instead of opening the e-mail to read it, we swipe left and erase it without ever opening it – the same is happening to your e-mails. Time is limited, we need to focus on the e-mails that matter: clients & leads. If you send me an e-mail that I feel is important, I save it for future reading – I’ll be honest, sometimes this doesn’t happen until 2-3 weeks later. But you’re not the only one e-mailing insurance adjusters. When I spoke with an adjuster friend of ours, she averaged 300 e-mails per day. Your e-mail needs to stand out for it to matter. What about a website and Google AdWords? When it comes to insurance defense work, a website is going to help you look professional. It’s not going to help you attract new clients. Insurance companies are not actively looking for private investigators on Google to see who they’re going to use next. They already have the large companies knocking on their doors asking for work, emails blasting away their productivity, sales people trying to get through the door, wall papers made out of business cards, you name it. In the even that you meet an interested adjuster and provide them with a business card, they may snoop around to see what kind of company you are. This is where a website will come in handy. You’re able to provide them with only the information that matters, and avoid the rest. Google AdWords are not going to help you, either. They won’t help you for the same reason I just mentioned above. I would focus your Google AdWords campaigns to attract domestic investigations: Cheating Spouses, Child Custody, Background Checks, etc. not for insurance adjusters. What does your agency offer? We help you with different marketing products to help you look professional and sharp when the time comes in which you meet a prospective client. We design presentation folders, brochures, flyers, business cards, etc. We start off with a website, then move on to smaller services. The goal of our marketing campaign is to help you look as professional as possible when it matters. 4 Private Investigator SEO Myths Murdering Your Website What is a Private Investigator Landing Page?